For National and International Orders (for delivery to areas outside of our local area map) please call us on 01305 834834. Pogles Wood is a family owned local business situated in Weymouth, Dorset and delivering to Dorchester, Portland and all surrounding areas. 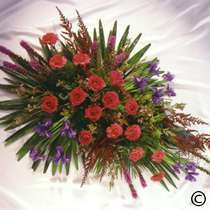 Our aim is to deliver only the best top quality flowers – professionally arranged to your requirements. The staff at Pogles have had over 22 years floristry and customer service experience and use this well to create the perfect experience for you. We guarantee your flowers are fresh – they are imported daily from Dutch Markets. We believe in high standards and good quality. Pogles Wood is open 9am – 5pm from Monday to Friday, and 9am – 2 pm Saturday, so we are always here to speak to you if you have any queries. We understand the importance of getting it right for those special occasions – whether it’s an anniversary, the birth of a baby or even if you just want to make someone feel special – we will provide the perfect gift from you. We don't just stop at flowers – chocolates, balloons, silk flower arrangements, vases, ceramics, fruit baskets, & gift vouchers are also available. Beautiful holly wreaths are also available over the Christmas period. We understand all aspects of your special day – Please go to our wedding section for more details. Contractual Work for floristry requirements in Weymouth, Dorchester, Portland and surrounding areas. Are you a local business in Weymouth, Dorchester and Portland areas? We have numerous contracts with local businesses in the area but would love to speak to you if you too are interested in contractual work. Please contact us personally to arrange a meeting. If you can’t see what you are looking for on our site, please feel free to give Pogles a telephone call on Weymouth 01305 834834, where one of our Friendly Staff will be more than happy to help you. Ordering with Pogles Wood Website (New small window) Pop up Problems? See here.